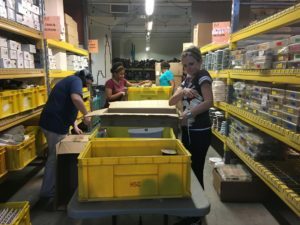 Last week I volunteered my time through New York Cares to help sort and organize art supplies at Materials for the Arts. I had no idea what this place was when I signed up to help, I was merely excited to help anything related to the arts. Materials for the Arts distributes free donations to thousands of participating nonprofit arts organizations and public schools. Kids can physically come to the warehouse with their school and “shop” for whatever supplies they need. The only payment required is a thank you note to the donating company or organization. 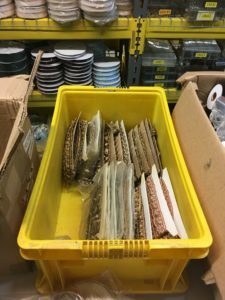 When I was given a tour of the 25,000 square foot warehouse in Long Island City, I was blown away. 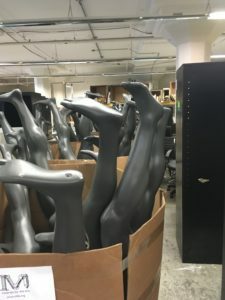 There were rows and rows of donated goods ranging from mannequins from Macy’s to bolts of fabric from the Garment District. As a professional organizer it warmed my room temp heart to see cast-off items getting repurposed for such an excellent cause. It takes hundreds of employees and volunteers to sift through the boxes of donations dropped off each week. Our job was to open up boxes and organize the contents. My team worked specifically with donations from M&J Trimming in Manhattan’s Garment District and other fabric stores. Most of these pieces were absolutely beautiful. There were six of us on the team and we worked quickly to establish what each crate should hold. We decided on color as one category and then went from there. The massive amount of shelving and crates made our work easy and deliberate. 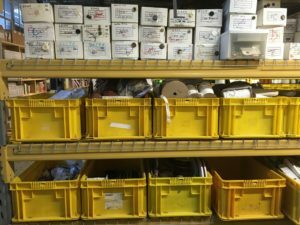 Organizing is a deeply personal task when it’s your own stuff. When it’s stuff that holds no emotional meaning, it can be methodical and focused. We all had the primary goal of emptying as many boxes in our 2 hour shift as we could. Having a small window of time to work with no outside distractions further proves my point that operating in small chunks of time is best when tackling a project. And micro-organizing doesn’t serve anyone. 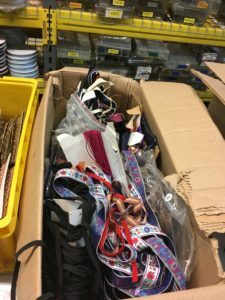 The object for us was to make the items easy to see and grab so that when “shoppers” are coming through with their carts they can pick out something quickly and then move on. Donating is something I strongly encourage when working with clients and this is the mothership of all possible donating opportunities. The arts need to be supported now more than ever and this feels like the perfect marriage of recycling and creativity. What a great experience!